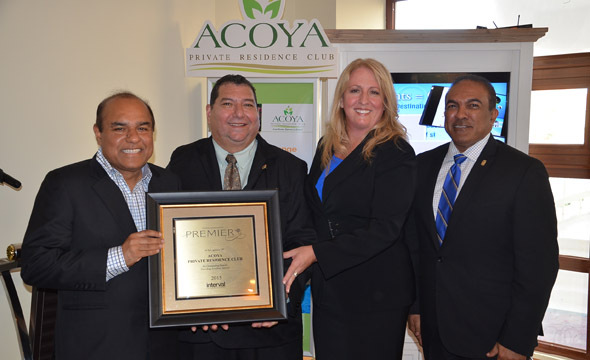 Interval International recently presented ACOYA Private Residence Club in Curacao, Dutch Antilles, with the Interval International Premier Resort® award for 2015. This designation is Interval’s top tier of recognition and acknowledges resorts that provide outstanding vacation experiences with state-of-the-art conveniences and modern features and appointments. Situated in the heart of Willemstad, the 10-acre luxury resort has 118 spacious units set on a natural lake. One-, two- , and three-bedroom units feature contemporary interiors with spacious living areas and fully equipped kitchens. All units have LCD flat-screen televisions and patios or balconies. Visitors can take advantage of a large selection of onsite amenities and services, including access to a private beach club, gourmet cuisine at Restaurant Seasons, Lotus Spa and Wellness Center, infinity pool and cabanas, Buddy Up Dive Center with fully-certified diving school, kids’ program, and complimentary Wi-Fi access. Additional activities, such as tennis, horseback riding, golf, windsurfing, deep sea fishing, and sailing are available nearby.